Safecare Medical Center received 4.5 out of 5 stars rating from Humana’s HEDIS Quality Program! Congratulations to Chiapone David Ting, M.D. 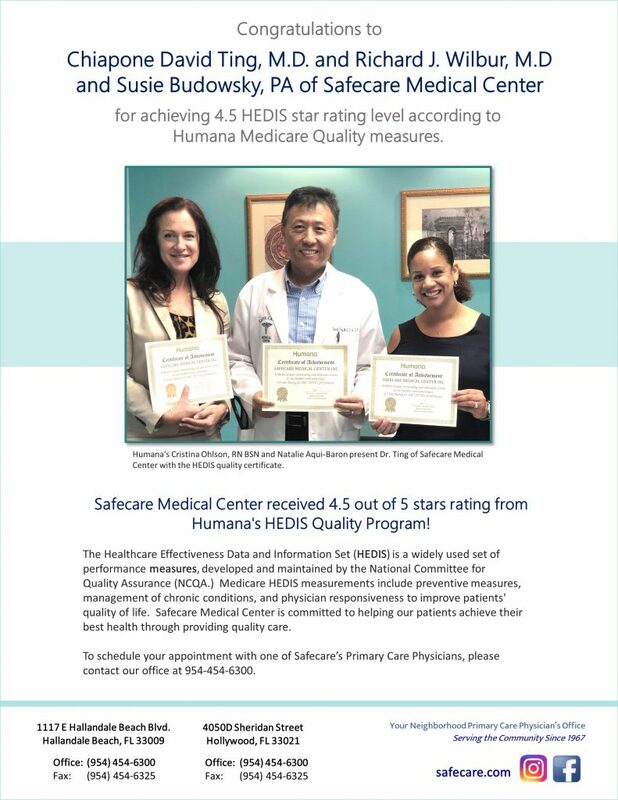 and Richard J. Wilbur, M.D and Susie Budowsky, PA of Safecare Medical Center for achieving 4.5 HEDIS star rating level according to Humana Medicare Quality measures. The Healthcare Effectiveness Data and Information Set (HEDIS) is a widely used set of performance measures, developed and maintained by the National Committee for Quality Assurance (NCQA.) Medicare HEDIS measurements include preventive measures, management of chronic conditions, and physician responsiveness to improve patients’ quality of life. Safecare Medical Center is committed to helping our patients achieve their best health through providing quality care.